Difference between revisions of "The Kopyright Liberation Front "The Black Room" (lost album from Scottish electronic band; 1992)"
The KLF (left: Drummond; right: Cauty). The Kopyright Liberation Front (a.k.a. 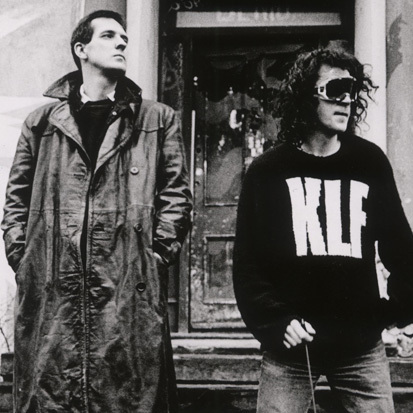 The KLF), were a Scottish electronic dance group consisting of Bill Drummond and Jimmy Cauty, active from 1987 to 1992. Having operated under a variety of pseudonyms, the band were notable for their subversive, anarchic public image and heavy use of sampling, which resulted in frequent legal issues regarding their output. The KLF released four studio albums (their first two being released under the name The Justified Ancients of Mu-Mu), coming to commercial prominence with the success of their fourth and final album, 1991's The White Room and its second single, "3 a.m. Eternal". The following year, the band infamously held a performance during the BRIT Awards in which they, together with Extreme Noise Terror, terrorized the audience and retired from the music business on the spot, before deleting their entire back-catalog. Additionally, the band wiped the master tapes for what would've been their follow up to The White Room, aptly titled The Black Room. The Black Room was first mentioned by Cauty in a 1990 interview with Record Mirror, during the production of The White Room. Cauty described the album as "electro turbo metal" that would be "so heavy it will just pin you to the floor." Cauty stated that this choice of sound was inspired by an anecdote where he and Drummond attended a rave with a malfunctioning sound system; the resultant combination of cacophonous screeching and low, droning bass drums captivated Cauty and Drummond, who sought to use this pseudo-industrial sound as a starting point for The Black Room. The following year, Drummond stated in an interview with X Magazine that The Black Room would be designed as a direct antithesis to The White Room sound-wise. Similarly to Cauty's earlier promises, Drummond described the album as both "techno-metal" and "Megadeath with drum machines." Drummond also expressed hope that The Black Room would be finished fairly quickly, citing a lack of attention span between himself and Cauty. During production, the KLF began collaborating with grindcore group Extreme Noise Terror, shifting the sound of The Black Room to thrash metal, more in line with the latter band's sound. At the same time, the album's release was delayed from the end of 1991 to March of 1992, roughly a year after the release of The White Room. According to vocalist Dean Jones, the KLF had initially considered working with Mötorhead to produce rock arrangements of their earlier songs, but came to Extreme Noise Terror when those plans fell through. This collaboration first resulted in a thrash metal arrangement of "3 a.m. Eternal" from The White Room, which saw a commercial release in January of 1992, and extended throughout the further recording of The Black Room. In February of 1992, Drummond and Cauty made the decision to disband the KLF. Keeping in line with their public image of subversion and anarchy, they did so via a performance of "3 a.m. Eternal" with Extreme Noise Terror at that year's BRIT Awards. During the performance, Drummond fired a machine gun filled with blanks over the audience, and a narrator announced over an intercom at the end of the performance that "the KLF have left the music business." Following this, the band dropped a dead sheep into the afterparty, removed their entire catalog from print, and wiped the master tapes for The Black Room; this elaborate stunt was believed by fans and music analysts to be an attempt at demonstrating that the band's ideals had not been compromised by commercial success. With that stunt, however, production of The Black Room permanently ceased. Because the album's master tapes were directly wiped before an official release could occur, it is unlikely that any version of The Black Room exists today. The thrash metal version of "3 a.m. Eternal" remains the sole surviving track from the album's recording sessions, providing just a small suggestion as to what The Black Room would've sounded like. However, in a 2003 interview with rocknerd.org, Cauty claimed that he still possessed a tape from the Black Room sessions and that a bootleg recording taken from them had been circulating underground. The veracity of Cauty's claims has yet to be determined, though.